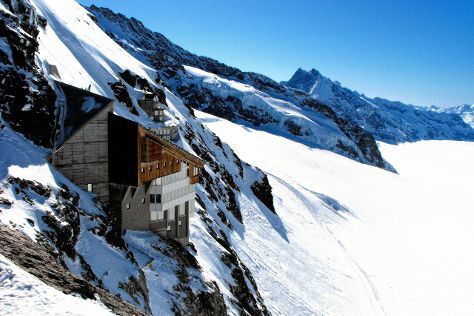 Your day-by-day itinerary now includes Jungfraujoch. There's much more to do: take your sightseeing to a higher altitude at Harderkulm, stop by Albert Schild AG - Swisssouvenir, stroll through Hohematte Park, and admire the sheer force of Trümmelbachfälle. To find photos, more things to do, traveler tips, and tourist information, read our Interlaken trip itinerary planner. Geneva to Interlaken is an approximately 2.5-hour car ride. You can also take a train; or take a bus. May in Interlaken sees daily highs of 63°F and lows of 45°F at night. Wrap up your sightseeing by early afternoon on the 30th (Thu) to allow time for the car ride to Lucerne. Your day-by-day itinerary now includes Free Walk Lucerne as well as Mount Titlis. And it doesn't end there: take in the awesome beauty at Mt Pilatus, get a taste of the local shopping with Altstadt Luzern, look and learn at Swiss Museum of Transport, and snap pictures at Chapel Bridge. To find other places to visit, reviews, traveler tips, and tourist information, you can read our Lucerne trip itinerary website . Traveling by car from Interlaken to Lucerne takes an hour. Alternatively, you can take a train. May in Lucerne sees daily highs of 65°F and lows of 48°F at night. Finish your sightseeing early on the 2nd (Sun) to allow enough time to drive back home.